-Fully fund Superintendent Botana's five-year plan to improve achievement and equity. -Ensure the city renovates all four rundown elementary schools, including Reiche. Studies show that the early preschool experience has broad and persistent impacts on learning, development, health, and well-being. Children who attend quality preschool programs grow up more likely to do well in school, graduate high school, find good jobs, and form more stable relationships. The benefits are particularly significant for children living in poverty—but these children are least likely to have access to high-quality programs. Many cities and states have universal pre-K programs, and some are moving to universal preschool for both 3- and 4-year-olds. For instance, the District of Columbia's program serves 66% of 3-year-olds and 88% of 4-year-olds. Vermont's preschool program reaches 75% of 4-year-olds and 60% of 3-year-olds. Even Oklahoma enrolls 74% of its 4-year-olds in pre-K.
Portland had a goal to achieve universal access to public pre-K for 4-year olds by 2016—but did not have a plan to get there, and we missed that deadline. Currently, only 22% of Portland's 4-year olds attend public preschool programs. Portland is behind the state as a whole—38.6% of 4-year olds in Maine attended public preschool programs in the 2016-2017 school year. There are many barriers that limit the ability of families to participate in Portland’s public preschool program, including hours, transportation, and the location of programs. The biggest barrier may be the fact that the school day ends at 1:30 p.m.—a challenge for many working families. In the past year, Portland Public Schools, in partnership with Starting Strong, completed a comprehensive study on the need for and barriers to public pre-K and brought stakeholders across the city together to develop a plan for high-quality pre-K for all. A draft of that plan is now available; click "read more" below to see the draft plan. Now it’s time to put the plan into action. Emily is committed to building on all of the work that’s been done in the city to put a strong plan in place to achieve high-quality preschool for all. As a member of the school board, one of Emily’s top three priorities will be fully funding the Portland Promise, the district’s five-year plan to improve achievement and equity. Emily loves our schools. She feels so fortunate that her two girls go to Portland Public Schools, where they are getting a good education and learning values that she cherishes: diversity, perseverance, and community. But we have big achievement and opportunity gaps and are leaving some kids behind because of a lack of resources. At the same time, the state is shifting education funds out of Portland. This spring, the city council threatened to cut as much as $4 million from the school budget. After an outcry from the community and a revised budget from the school board, the council still voted to cut $1.2 million from the school budget. We now have two fewer days of school this year, fewer elementary school teachers and larger class sizes, and an administration that is cut to the bone. The portion of the city's budget dedicated to schools has declined over the past 10 years from 52.5% to 49% of the tax levy. Portland now spends the least per student on education of all of our neighboring communities, other than Westbrook. With more state funding cuts on the horizon, the Portland School Board is conducting a large Enrollment and Facilities Study this fall to evaluate potential school closures, consolidation, and redistricting. They have put on the table closing island schools, creating new grade combinations like K-8 schools, consolidating the high schools, closing neighborhood elementary schools, and redistricting, among other options (see article linked below to learn more about these plans). This is not the right direction for our schools: Neighborhood elementary schools and school choice for our high schools are hallmarks of the Portland Schools. Research shows that school consolidation is associated with worse student outcomes, less family involvement in the schools, and poorer job satisfaction among teachers. School closures also cause property values to decline. Certainly, we should always look for efficiencies and ways to save money in the budget, but we should not compromise our progress in meeting the Portland Promise. If a program is no longer needed, we should cut it. If we can find better ways to work, we should be open to that. And we should aggressively pursue additional funding from state and local options, such as expanding the city’s Tax Increment Financing districts in the short term, as well as longer-term solutions, like local option taxes. But at the core, we need to convince the city council that Portland’s schools should be a top priority. There's so much support for public education across the city. Our schools need the resources to achieve the Portland Promise and enable every Portland child to thrive. To get there, Emily believes we need to more meaningfully engage the community and city council so they better understand the strengths and challenges of the schools and commit to the Portland Promise. That deeper level of engagement can then help the city council prioritize the schools. And it will help the community—businesses, alumni, and community organizations—all work together to provide students with the opportunities they need to close the achievement gap. In November 2017, Portland voters passed a $64 million bond to renovate the city's four rundown elementary schools—Reiche, Presumpscot, Longfellow, and Lyseth. The bond passed overwhelmingly, with 77% of the vote in District 2 and 65% citywide. Emily is proud to have led that campaign. 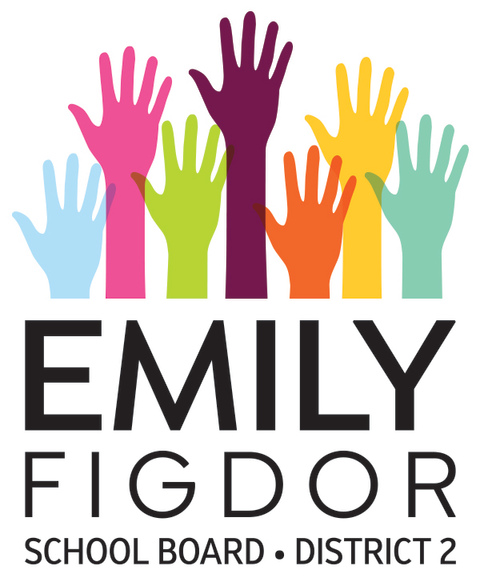 Emily started working on the issue in 2015 and, for the last three months of the campaign, left her job at MoveOn to run the campaign full time as a volunteer. (After passing the bond, MoveOn hired her back.) Emily now serves on the committee overseeing the renovations, and the work is underway! Lyseth is the first school being renovated, and we're scheduled to break ground on the project next spring. But because the state is shifting education funding to poorer districts, the district is now considering closing and consolidating schools, including those the voters just overwhelmingly decided to rebuild. The district is doing an enrollment and facilities study—similar to what was done for the elementary schools in 2012 in laying the groundwork for the school bond. Closing neighborhood schools is not the answer. The voters have already spoken to say that these four schools all need to be renovated. And the renovations are long overdue. Students at the four schools are taught in hallways, mechanical closets, and trailers. The schools fail to meet 21st century standards and codes, and they have asbestos and fire hazards. The #1 problem at Reiche, an open-concept school, is the noise. The building lacks walls between the classrooms, and the ambient noise is far above acceptable decibel levels, making it hard to concentrate and learn. School facilities have a profound impact on student outcomes. School facilities affect students' health, behavior, self-esteem, engagement, learning, and achievement. Students who attend new or updated schools report feeling safer and more proud, and they better enjoy school. No child in Portland should attend crumbling, substandard schools. For 23 years, city officials debated what to do about the condition of the elementary schools, convening seven different task forces and hiring architectural firms six different times to develop plans. The cost of renovating the schools doubled in the decades city leaders spun their wheels. To be clear: School construction and renovation is a local responsibility, and Portland hadn’t made a major investment in the city’s school buildings since the early 1990s. During that nearly one-quarter of a century, communities all around us have been busy passing local bonds to build new schools and renovate old schools. Some people ask, "What about the state?" The state rejected Portland's requests to pay to renovate the four elementary schools four times over 16 years. Moreover, the state program is for the worst of the worst schools statewide and was never meant to be the sole source of school construction funding for Portland or any other municipality. It took the community coming together to pass the bond and fix the schools. Thousands of people across the city were involved. They testified before the school board, ad hoc committee on school facilities, and city council. They attended rallies, contacted their school board reps and city councilors, and signed postcards and petitions in support of fixing all four schools. The Portland Education Association, building and construction trades, and more than 100 Portland businesses helped out. And last summer and fall, volunteers knocked on more than 25,000 doors across the city to educate voters about the poor conditions of the elementary schools and the confusing ballot with two competing school bond questions. During the last four days before the vote, volunteers filled 165 3-hour shifts to connect with voters before Election Day. And now that the bond has passed and we have a plan to fix the elementary schools, the city has applied to the state to renovate two of our high schools, which are bigger and more expensive projects. In June, the state released its initial priority list, and Portland High is 15th on the list. PATHs also made the list and is 25th. This is great news for Portland. Passing the bond is a testament to the power of people coming together to make change in their own communities. Emily is committed to making sure all four elementary schools are renovated.